Was Diana's Extremely Convenient Death an Accident? Princess Diana said in her BBC TV interview that she was a problem for the British royal family because she was a rebel and REFUSED to go quietly. She went "with a bang" (in fact a crash; bang; wallop). Diana was a big embarrassment to the royal family because she was the mother of the royal family's future king and she was, to them, a loose cannon (totally out of their control) and the focus of the world media and world-attention. Not only was she an embarrassment to them but every day she was becoming more of an embarrassment to them, with no end in sight. In fact, to the royal family and the "System", the future must have looked ever more embarrassing and uncertain, which must have been causing them and the "System" a great deal of worry. All of the EVIL that the "System" does to people, it does in the monarch's name - "ON HER MAJESTY'S SERVICE" - all of the illegal man-made laws; judgements; parliament; economics - all to keep the "System" in control; "jobs for the boys - the old school TIE-fighters" for life and everyone else SLAVES to it. Discredit the monarchy by making it look ridiculous; evil or just ordinary and what would happen to the "System" and its control over the people?? Anarchy perhaps?? Or equality? The rich losing their positions of wealth and power, with equality and social-justice ensuing? The rich could not ever allow equality and social-justice to reign in the land, instead of them. That would never do, for them. Diana told the doctor after the car-crash that she was 6 weeks pregnant ("Interviu" says 10 weeks), out of wedlock, and to an Egyptian, whose dad had embarrassed parliament; been refused British citizenship and who has powerful enemies in the British Hierarchy, who hate him. Could those enemies allow him to become close to and loved by the future king? What would happen to them in the future if they did? The planned marriage to Dodi would have made the future king into the stepson of an Arab and a Muslim, which would not have pleased the Church of England, of whom the British Sovereign is the head. We know that already; because of Charles. Dodi's son, that Diana was reported to be expecting, would have been the future king's half-brother and half Arab and a Muslim. Diana herself was planning to become a Muslim. How would both factors have affected the future king; and the Church of England which is reputed to be the biggest and richest land-owner in Britain, £££££££/$$$$$$$? Princess Diana was planning to convert to Islam and to go to live in America and/or France and that would have caused great problems for the custody, visiting rights and safety of the future king. Could the system allow that to happen? Not to mention the emotional traumas and their effects on the future king's mind. Would he prefer America or France and living there to living in Britain? What would happen if he did? In "Tinsel-town", California; or Mrs. Wallace Simpson and the abdicated king Edward 8's mansion in Paris, that Mohammed Al Fayed had bought for Diana and Dodi? The possibilities are endless and must have been very frightening to the British Monarchy and The Establishment. To the "Monarchy" the future must have looked like a nightmare with anything possible, including its collapse. The only solution they would be praying for, as Diana said herself, would be that Diana would disappear from the scene: at which point all of their troubles would disappear with her, leaving Charles with undisputed custody of his children and free to legally remarry a virgin or a "Widow". Camilla Parker-Bowles is not a widow. Should Mr. Parker-Bowles sleep with one eye open?? The accident (??) happened in France; which, if you wanted an accident to happen, would be the very best place for it to happen, for proximity, but outside of Britain. Paris would be perfect. The Parisians are well-noted for their erratic-driving and there is no love lost between the British and the French. With a Frenchman driving, it couldn't be better. If the British were involved in the death, who could prove it? The bodyguard was the only one wearing a safety-belt. Did he know something the others didn't? It was his duty to protect Diana and if he considered that the circumstances made it necessary or prudent to wear his own safety-belt, then his first duty would have been to make sure Diana's was fastened first, before his own. He did not do so. An over-sight? There is new evidence (2011) that the reason Princess Diana was not wearing her seatbelt is because it was mysteriously, but very conveniently jammed in such a way as to render it unusable! The bodyguard, we are told, is an ex-paratrooper. Working for the royal family? Most paratroopers are brave men, sworn to die for queen and country; if necessary. In the very first reports of Princess Diana's car-crash, on tape, there are, from the beginning of reports, to the next day at least, some taped news reports that have curious bits not talked about later, like how a bomb-sound was heard clearly, BEFORE the sound of crashing. But later those first witnesses were never used in subsequent news-coverage! We are told that the driver was drunk. The bodyguard said he was not, or he would not have let him drive because he was responsible for Diana's safety. The Ritz staff said he was not drunk and that he was not in the habit of drinking on duty and the Ritz video-footage shows Henri Paul looking sober, in the foyer of the Ritz Hotel. The body-guard says he was responsible for Diana's safety, so why do the royals want to sue Mohammed Al Fayed, instead of their own employee: the body-guard? The Ritz Management said that Henri Paul had been on special driving courses at Mercedes-Benz. Later we are told he was not licensed to drive this type of vehicle. Why all these contradictions? The "Ministry of Dirty-Tricks"'s dis-information to cloud the issue, perhaps?? Whose ministry? British, or French; or both together? Mohammed Al Fayed doesn't trust the official investigation and is doing his own. Mohammed Al Fayed said on television on 19/1/99 that the blood-samples from Henri Paul's body have been tampered with because with the level of intoxicants that the authorities claim they found in them, Henri Paul would have been unable even to stand up. Why, after the accident (? ), was Diana kept in the Pont de l'Alma (Bridge of the Soul) Tunnel - the crash-site - for 90 minutes, instead of being transferred as quickly as possible to a hospital? It took 1 hour and 45 minutes after the accident had happened to get her to a hospital. Why, when she was eventually taken to a hospital, was she taken extremely slowly, by the longest route, to the hospital which was the fifth farthest away, and why did the ambulance stop and wait, for 10 minutes, less than 800 yards from the hospital? What were they doing to her during those crucial 10 minutes? Making sure she would not survive? A book has been published, in America, in which it is claimed, that, if Diana had been taken immediately to hospital, she would have survived. The French doctor who was first on the scene, Dr. Maillez, said Diana's condition was, "Not catastrophic" and added "she did not seem desperate." Author Brian Desborough claims that Diana was bludgeoned to death with an oxygen-cylinder, in the Pont de l'Alma Tunnel - or in those 10 minutes that the ambulance was parked 800 yards from the hospital? The ambulance and authorities controlling the situation after the crash were not British; they were all French. Why did they cause/allow the long delay? If it wasn't an accident, was there collusion between the British and French secret services? If so, why would they collude, and, can we believe the autopsy results on Henri Paul, or trust the judge and investigators? Mohammed Al Fayed doesn't. Should we? If it was an accident, why didn't the French authorities rush Diana to hospital? If Diana had lived; in Britain, the U.S.A., or France, or all three, and continued her work, when all three are major manufacturers and exporters of weapons of war (land-mines, etc.)??? We were told and prepared, in advance, for the "fact" that Diana's bodyguard would probably, if not almost certainly, have amnesia, possibly permanently. The bodyguard has remembered only that a car followed them all the way from the Ritz Hotel. There were pieces of a Fiat Uno car's rear light-lense at the scene of the "accident" and white car-paint from another vehicle on the wing of the Mercedes. This white Fiat car and driver has not been found or come forward. If he didn't cause the accident why hasn't he come forward to tell the world what happened and earn lots of money from exclusives? If he did cause the accident; did he do it on purpose, and, if so, why? It was because he was murdered with two bullets in the back of his head and his white Fiat Uno car set on fire, with him locked inside it, and he didn't have the keys on him. How did he shoot himself in the back of the head, not once, but twice, with no gun found at the scene, and then manage to set his car on fire? There was also reported to be a powerful motorbike in front of the Mercedes at the time of the accident. 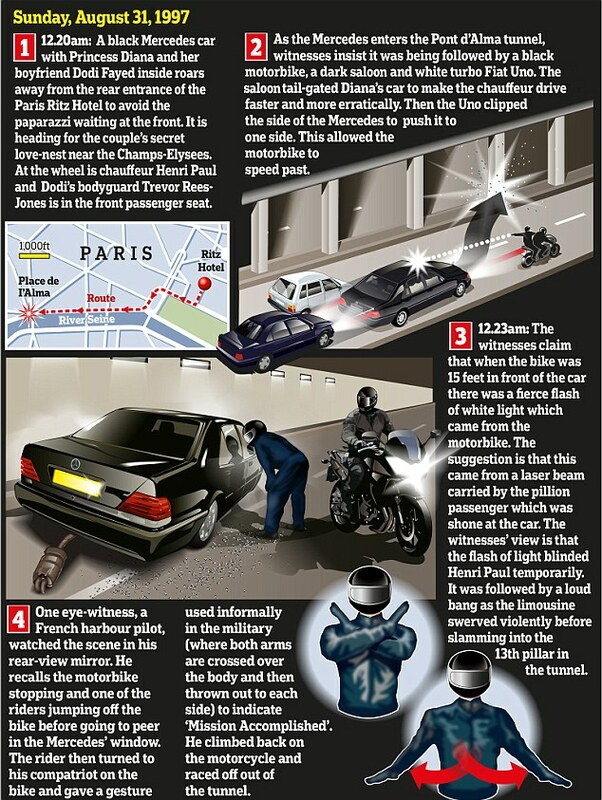 Did the pillion-rider set off his flashgun into Henri Paul's eyes to temporarily blind him? This motorcyclist has also not come forward or been found. Was he really a Paparazzi? There have been no photographs (which would be worth a fortune) from this motor-cyclist who was so desperate to get some photographs that he was taking them at over 100 m.p.h. Strange don't you think? It has recently been reported (5/Sept/2013) that it was the SAS and a high-powered strobe-light, that was far more powerful than a photographer's flash-gun. A blinded-driver? ; another car? ; a quick nudge at that speed? ; bright flash from a strobe-light? ; explosion and the SAS's "The Boston Brakes" assassination-technique? Instantly, all of the so-called royal's troubles are over. The perfect solution? An answer to their prayers? Was it an accident? Was it destiny? Were powers of Darkness involved? Are his enemies trying to make Mohammed Al Fayed the scape-goat? A prophecy (Q. 9,12) of Nostradamus the French Prophet has been related to the death, in France, of Diana but there is another; a Scriptural Prophecy and that, unlike Nostradamus, is NEVER wrong, and it states that just before the End the "Sun" shall lose her light (power), which Nostradamus agrees with in Quatrain 10,22. Lui & les siens d'or seront abbreuuez. He and his followers will be steeped in gold. Mais son lieu qui de roy n'aura signe. In her place put one who will have no mark of a king. With the long Prophesied breaking away of the Americans (Isa. 49:20) and the eventual decline and fall of the British Empire, during the "Time of Jacob's Trouble": including a royal abdication; divorces; antics and scandals; the light of that "Sun" has almost been extinguished. How close is the End? Tombera gresle lors plus grosse qu'un oeuf. Venus (Christ's planet) too, Cancer (Moon/Commonwealth), Mars (war - Armageddon) in the Brides of Christ - Israel (Pleiades - Seven Sisters - Nonnay/Nuns). Hailstones bigger than an egg will then fall (Ezekiel 38:22). (Ezekiel chapters 38 & 39 are the chapters prophesying the great Battle of Armageddon). The answers, which are also written in Scriptural Prophecy are there for all to see on the JAH "Prophecy page". In the meantime please read my "The SIGNS of The END Times" article. Forget Religions; this is The Ruler of The Entire Universe's (God's) Prophecy - Divine and Infallible, as has already been proved, indisputably, by Planet Earth's own recorded history. The Duchess of York - a very uncharacteristically subdued sounding Sarah "Fergy" Ferguson, the "tough" daughter of a British Army Officer; in a CNN interview given to explain why she did NOT attend the Windsor's 50th Wedding Anniversary; told us that women like her, who fall out of favour with the sovereign, are usually BEHEADED, so she is doing alright and staying out of their way. Was she subtly trying to tell us something about Diana's death and her own suspicions about it and also her fears for her own life? What do she and Kitty Kelly think of all these questions, that the world who loved Diana DESERVES to have answered? What does William think about his mummy's untimely death? "The People"'s opinion-poll result, reported on 9/Nov/97, said that more than 98% of the thousands of British people polled believe that Diana WAS MURDERED. An Egyptian lawyer is also so totally convinced that Diana and Dodi were murdered that he has filed a private prosecution against the British Prime Minister Tony Blair and Elizabeth 2. Are those thousands of British people and that Egyptian lawyer all wrong? Who knows the British Monarchy better than the British people themselves? Will they allow themselves to forget their suspicions about Diana's death? Will they allow all these questions to go unanswered? Unfortuntely the answer is almost certainly, yes. I hope I'm wrong about them, for their own sakes, because a people will always get the government it deserves. Why is Charles, suddenly, so uncharacteristically cheerful and friendly with, and even seems to be actively courting, the press; who are collectively blamed for Diana's death? That, and the Windsor's 50th Wedding Anniversary celebrations seem to have taken people's minds TOTALLY off Diana's death and everything in the garden is now rosy again. In fact, rosier than it has been for years, with no Diana, and Fergy keeping a low profile. The perfect public-relations campaign solution to the Windsor's problems; executed with surgical precision??? Will it succeed? If it wasn't an accident will the perpetrators get away with it? Nostradamus seems to indicate that it wasn't an accident and that the British monarchy is going to be driven into exile. To Mitylene (Greece) she will go through port and by land. Suite par fer: foi fera outrage. Copyright © 1999 JAH. All rights reserved. Recently the British Monarchy's on-going campaign, to make everyone forget about princess Diana and what happened to her, has entered into what is probably going to be its final phase - that of replacing her with a look-alike princess, whose public promotion they hope will finally sweep all of the unanswered questions under the carpet forever. Sophie Rees-Jones is not only a close look-alike but she is slowly learning, or being taught, to copy Diana's mannerisms too. True love; or a cynical and calculated scheme to cover up the Truth about Diana's death? That plot did not work, because Sophie does not have the charisma to carry it off, but now THEY have managed to replace Diana with Kate Middleton and we are having her rammed down our throats, with the engagement, wedding and the new baby. Not that I have anything against Kate, as she seems quite sweet. Have the thousands of people polled by "The People"; and the millions of people of whom they were the representatives, more than 98% of whom are certain in their belief that Diana was murdered; decided to just forget about it? The article in yesterday's The Guardian would seem to confirm my suspicion that there may have been collusion between the secret services not just of Britain and France but also of the U.S.A. and others. In the Guardian front-page article the people, who claim to have worked for the CIA and against whom the American authorities have done nothing to bring them to justice and actually seem reluctant to pursue, tried to fraudulently sell documentary evidence of the collusion between MI6; Elizabeth 2 and the CIA in Diana's death to Mohammed Al Fayed for $20m. "Mr. Al Fayed claims that the CIA has intervened to prevent the authorities from prosecuting the men involved in an attempt to mask its involvement in the affair. In a further twist, Le Winter (who claims to have been a high-ranking CIA agent - denied by the CIA) has since claimed, during two meetings with the Harrods' head of security, that although the papers shown to Mr. Al Fayed were forgeries, they were copies of real documents held by the CIA." America refused to sign the world-wide ban on land-mines, even after Diana's death, and, in the film JFK, Colonel X says the American arms-manufacturers murdered JFK because he wanted to end the Vietnam War and they would not be able to sell their weapons. Now Diana and his son John F. Kennedy Jr. are mysteriously dead too. The lengths people are prepared to go to, to sell weapons, seem to know no limit. JAH. THE ONBOARD COMPUTER CHIP HAD BEEN TAMPERED WITH! The onboard computer chip controls, amongst other things, navigation, acceleration, steering and braking of a vehicle. Considering that Princess Diana's death was due to a car-crash, the fact that the Mercedes S280 involved in the crash had its onboard computer chip stolen some days earlier (and nothing else...suggesting the car-snatchers were no ordinary thieves) indicates sabotage. There actually exists a well-established assassination-technique from the 1980s (developed by the British SAS) nicknamed "The Boston Brakes", which involves steering, braking and acceleration capability being taken over by remote control! In fact world famous explorer and former SAS officer, Sir Ranulph Fiennes did indeed confirm the relatively common use of this assassination method, with particular reference to the death in England of one Major Michael Marman, in a car accident that bears uncanny resemblance to that of Princess Diana, Dodi Al Fayed and Henri Paul. Assuming you want to execute a very sensitive, high profile assassination, but at the same time create as little fuss as possible, the best way to go about it is to make it look like an accident. Keeping that in mind the disappearance of the onboard computer chip from the "Crash S280" then makes a lot of sense. Steal the car, remove the onboard computer chip, replace the old chip with a new doctored onboard computer chip that allows another party to gain remote control over the car and you've got yourselves an accident (read "assassination") in the making! Furthermore, very suspiciously, the stolen Mercedes Benz S280 was the only vehicle "available" to the Princess and her companions that night! Talk about leaving nothing to chance! If the car had been traveling anywhere near those speeds, seat-belt-or-not NOBODY would have survived that crash (the only person to survive the crash was bodyguard Trevor Rhys-Jones, who sat in the passenger seat and is widely believed to have been an operative of the MI6, or MI5 branches of the British Secret Service). Many professional drivers have decried the authority-cited-speeds (120mph region) as being absolutely preposterous, and, from the evidence available to them, put the car at about 60 mph (96km/h) at the time of the accident. To date, Mercedes Benz has never been able to examine the car for the simple reason the authorities never allowed them. This in itself is very suspicious, because Mercedes Benz experts should have been party to the panel of experts examining the car! Why were they denied access? How about if for no other reason than they built and engineered the vehicle and thus would have been in an excellent position to determine how fast the car was going and what caused the various impact damage to the vehicle, and whether it had been tampered-with. It would appear though that an internal investigation conducted by Mercedes Benz (albeit with the rather limited information available to them) seemed to suggest a speed of 60mph was far more reasonable than the 120mph spread by authorities, and that the safety protective features of the Mercedes more or less behaved as expected. This may explain why Trevor Rhys-Jones who was seat-belted in the passenger seat, and thereby in the least likely position for surviving such an accident, survived! (The passenger seat is known in the industry as "The Death Seat"). The Mercedes engineered safety mechanisms that helped preserve Mr. Jones' life, incorporate the engine block being forced under the car, and not into the passenger compartment, following the tremendous force from such a collision as the one that occurred in the Paris tunnel that night. The widespread view is that had Princess Diana and Dodi Al Fayed been wearing seatbelts they would have likely survived the crash! (Hmmm...perhaps not! Princess Diana did survive the crash and actually spoke to a French Doctor (not affiliated with the authorities who arrived shortly after), who was passing by at the time of the accident, and as he administered the 1st First Aid, in his own words said "I thought her life could be saved" "Her injuries were not catastrophic." "She did not seem desperate."). Princess Diana ultimately died because of a suspicious 1 hour and 45 minutes' journey in an ambulance that snailed its way to a hospital 3.25 miles away, averaging a speed of 25 mph and which conveniently bypassed 4 other hospitals on the way! As it is there is new evidence (2011) that indicates that perhaps the reason Princess Diana was not wearing her seatbelt is because it was mysteriously, but very conveniently, jammed in such a way as to render it unusable! Diana, that SAS murder claim and why it may not be as mad as you think: 16 years on, the conspiracy theories won't go away. Sue Reid, who's studied all the evidence, has found tantalising new clues. An SAS sniper's claims that the elite regiment murdered Princess Diana are "utterly convincing", police have been told. The former sniper's estranged wife has informed Scotland Yard she is completely sure he is telling the truth. She told Scotland Yard detectives how the veteran soldier had spoken about the involvement of an SAS hit-squad in the car-crash that killed Diana and her boyfriend Dodi Al Fayed on several occasions. Significantly, she said that the sergeant's allegations came while they were on good terms and before their marriage had hit the rocks. One source said: "This was not said to scare or threaten her. It came out when there was no marital strife and when they were still friends. "She was utterly convinced he was telling the truth when he said the SAS was involved in Diana, Dodi Al Fayed and Henri Paul's deaths." Soldier N apparently claimed Diana and Dodi's driver Henri Paul were blinded by an intense flash of light moments before he lost control of their Mercedes. The claim appears to support testimony from an ex-spy at the inquest into Diana and Dodi's death. The former MI6 agent told the hearing that he was aware of a colleague's proposal to kill Serbian leader Slobodan Milosevic, by using a strobe light in a tunnel to distract his driver, causing a crash. He revealed the existence of a shadowy unit within the SAS known as "The Increment", which comprises troops from the SAS and SBS for the purposes of carrying out lethal operations on behalf of MI6. She was utterly convinced he was telling the truth when he said the SAS was involved in Diana and Dodi Al Fayed's deaths. Last week, Detective Chief Inspector Philip Easton and a Scotland Yard colleague travelled to a secret location to interview her. Mr. Easton, who worked on the Yard's original inquiry into Diana's death, is believed to have quizzed Soldier N's estranged wife very closely. She is said to have given a "compelling account" of what her husband had told her. She does not think the claims are too fantastic: "Not when you're living with someone who is in the SAS." After the Diana allegations first surfaced, he was branded a "loose cannon", who could not be believed, but Army friends have rallied round Soldier N.
The decorated special-forces veteran has been welcomed into the SAS Association - the exclusive club for former members of the elite unit. And an official report was omitted from inquiries into the 1997 crash - with clues highlighted by a top British investigator withheld from the inquest into Diana's death. World-renowned accident examiner David Price meticulously deconstructed the luxury car. But he told last night how he was "surprised" never to have been called to give evidence at the hearing. The shambolic handling of the initial investigation into the accident even saw parts of the car destroyed while in the possession of the French authorities. But the most explosive revelation to emerge from his report was that a foot-long section of brake pipe - leading to the front right brake - was never handed over to British investigators, making it impossible to disprove tampering. Caused by the explosion that was heard immediately before the crash? Part of "The Boston Brakes" technique? Institute of Traffic Accident Investigators expert Mr. Price conducted a forensic examination, and his report was used by the authors of Operation Paget, the police probe into the fatal crash. The vehicle's brake fluid was found to contain a level of water that could have interfered with braking efficiency, but it was brushed off as post-crash contamination. Its front right tyre contained "a considerable quantity of water", which was never measured or analysed to determine its origin, potentially affecting the handling of the vehicle. Reports that the car had been handling poorly before the crash were never recorded as part of Operation Paget, the inquiry led by Lord Stevens, which investigated conspiracy theories surrounding the accident. Mr. Price, 55, who worked for the Forensic Science Service for 31 years, told the Daily Express from France last night: "It was a surprise I was not called to deal with some of these issues. "The inquest spent a lot of time with witnesses who saw things and heard things, but it didn't ask questions about the car itself. Issues were being raised such as brake-tampering, so I was surprised not to have been called. "The frustrating thing for me is that my report is not freely available, because this was such a high-profile case and I'm not trying to hide anything." In his report he wrote: "I am not able to exclude the possibility of brake pipes having been cut prior to the incident, although I consider it highly unlikely that they had been, as it should have been readily obvious to the French investigators when they removed the ABS modulator. Chauffeur Olivier Lafaye drove the car hours before the crash and reported the back end "slewing out" at speed. His comments were not recorded in Paget and he was not called at the inquest. "Whilst I did not observe any signs of staining that I considered might have resulted from brake fluid having been ejected during use, I consider the extent of the damage and the existence of smashed oil-containing items, such as the engine, precluded me from being entirely certain." The report, obtained under Freedom of Information laws, showed the car's Electronic Control Unit, responsible for the brakes, had a "fault" code stored. Mr. Price wrote: "I consider it most probable that one or more wheels had skidded. I am not an expert in electronics and so I consider it probable the only persons who could provide expert evidence in the precise functioning of the units would be (Mercedes) design engineers." He added: "Only they (Mercedes Benz engineers who were denied access to the car) are likely to have knowledge of the precise operating parameters." But Paget ignored this lead, simply stating: "David Price concluded that no additional testing was possible. Paint taken from the tunnel and the car and its front right door were lost in an "unexplained fire" in 1999. Its front wing was also destroyed on the orders of a French judge in 2003. Now please read "The Truth about The British Monarchy".